We were on the hunt for fried chicken the night of Game 7, and headed on over to Crawford's in Westlake. That turned out to be a big mistake, given that the place was jam packed, standing room only (with the crowd chanting "Let's Go Dodgers" when I walked in). 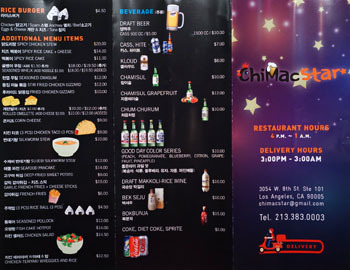 Disheartened, we looked at other options, and finally settled on the new-ish ChiMac Star after some deliberation. 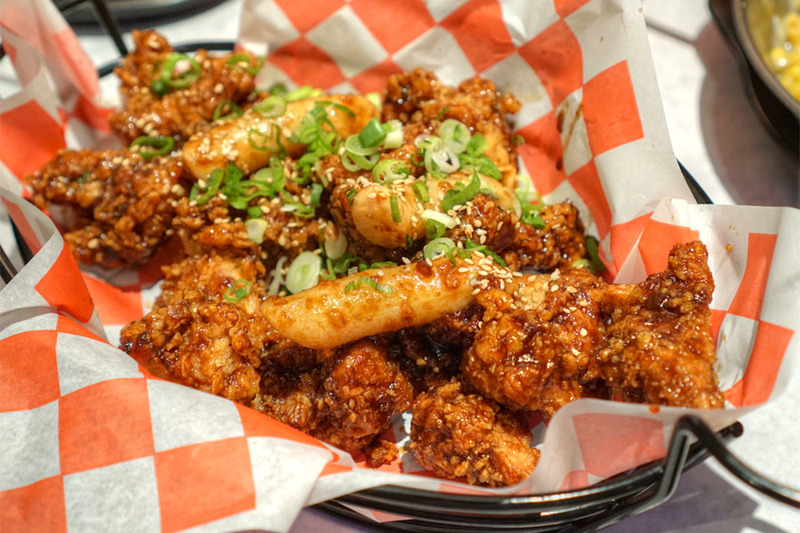 The restaurant opened in late August this year, and as you might expect given the name, focuses on chimaek, or the popular Korean combination of fried chicken and beer. 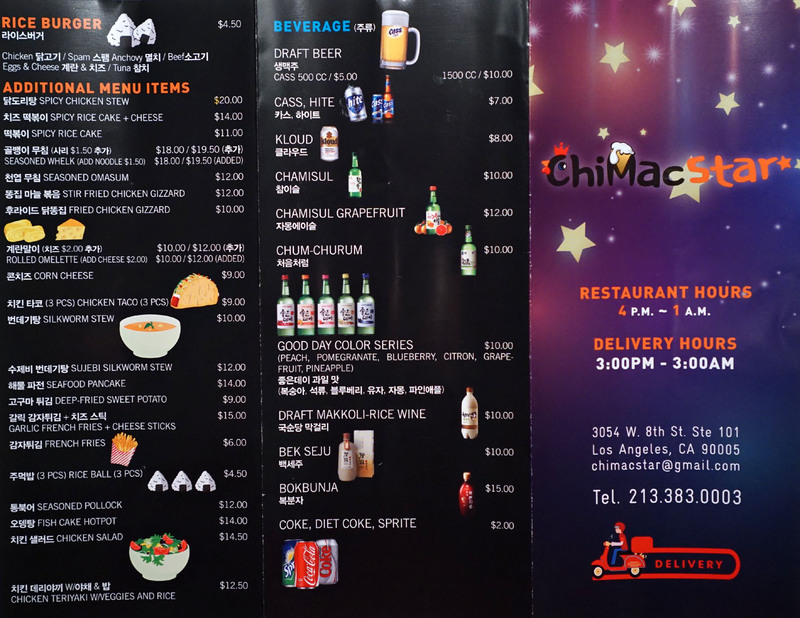 The restaurant sits on the eastern edge of Koreatown, within spitting distance of the now-shuttered Tofu and Noodles (which I really liked). 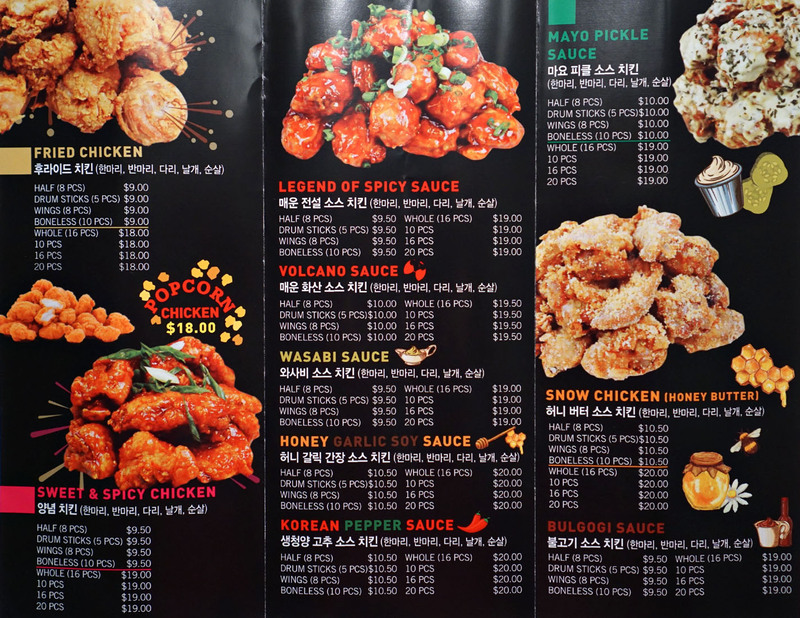 It takes over the former home of the longstanding Mazinga Z, a sooljib-type place also with a focus on fried chicken. Inside, the setup isn't too different, though the space has been brightened up. 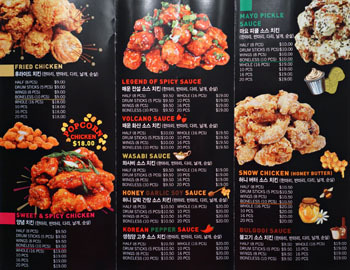 Menu-wise, you get ten varieties of chikin, all of which are available in multiple formats, and these are joined by an array of anju-type dishes. To drink, meanwhile, you'll find your typical spread. Click for larger versions. Our complimentary snack wasn't very palatable. 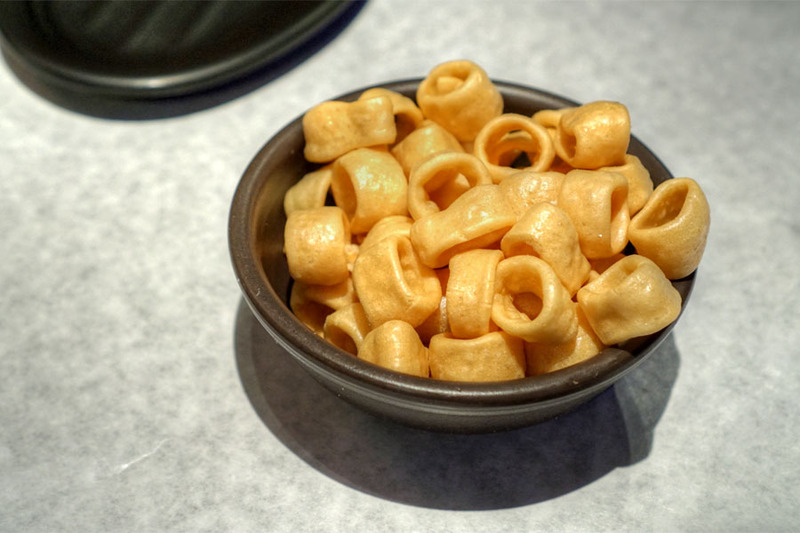 Think of 'em as a slightly less bland version of packaging peanuts, in ring form. 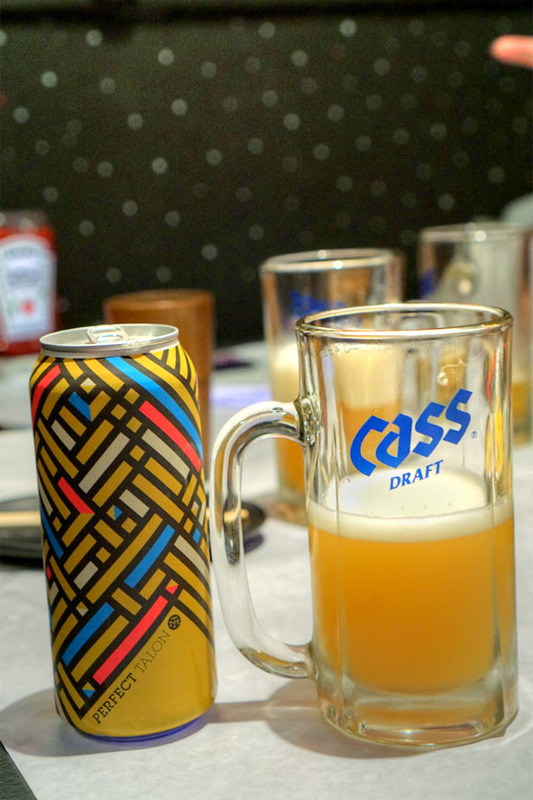 To drink we had the 2017 Modern Times Perfect Talon, an IPA hopped with Simcoe, El Dorado, Denali, Amarillo, Idaho 7, and Citra. The nose was appealing, with aromatic hops intertwined with sweet, juicy citrus. On the palate, I got a good amount of hop bitterness at first, which was then accompanied by dank, citrusy notes, with the finish giving up more tropical fruit. We felt compelled to start with the classic, unadorned hulaideu chikin, which I found a touch underseasoned, but still tasty. The drumstick was my preferred part, coming out all tender and juicy, with a properly crunchy skin. The white meat wasn't bad, but definitely ate drier. 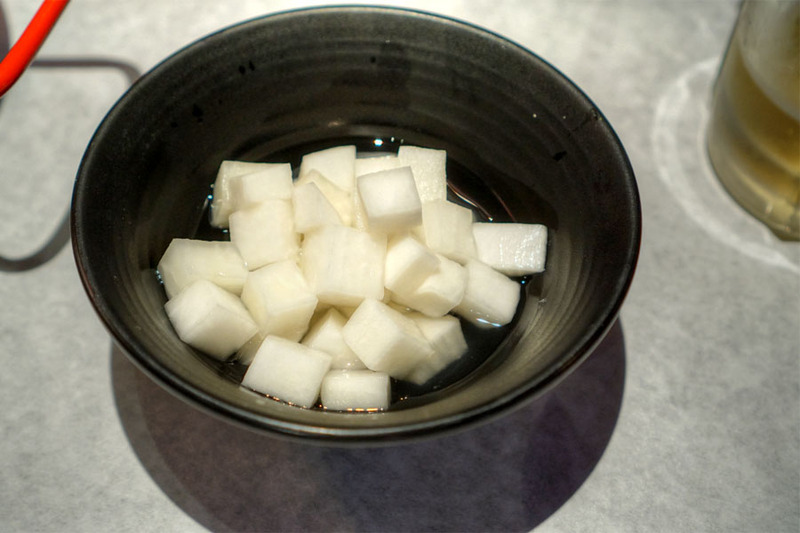 Cylinders of tteok were a bit of a surprise to see, but I don't think they added much to the dish. The kon chijeu was pretty much on point. 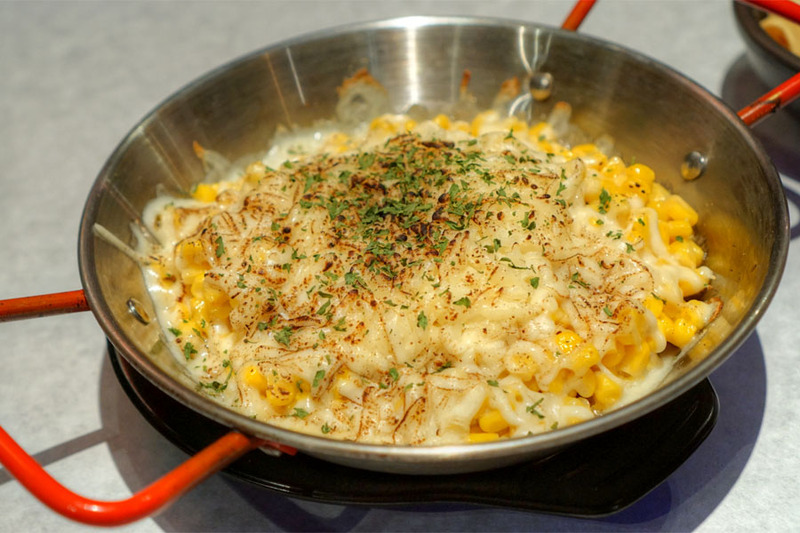 The kernels came out sweet and well-textured, and definitely worked as a stage for the hefty, well-charred cheese. 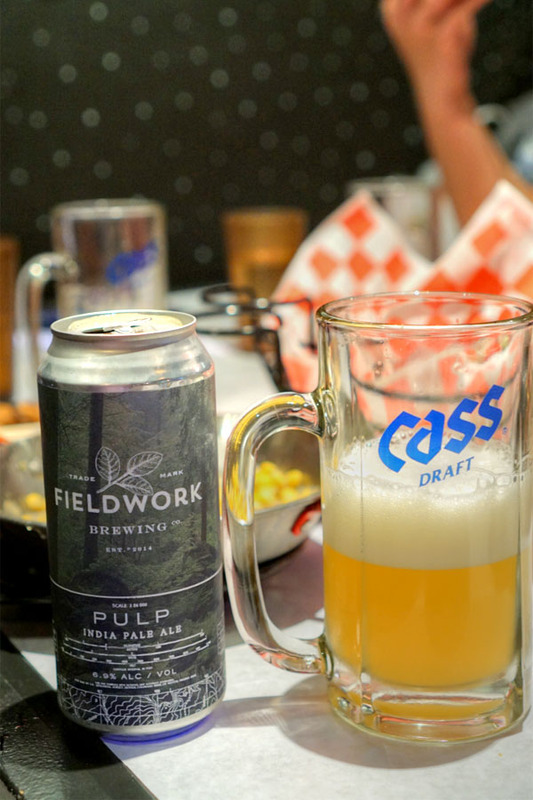 Next to drink came the 2017 Fieldwork Pulp, an unfined, northeast-style IPA with Citra. The nose on this one was surprisingly restrained, with just some light grassy, hoppy notes and a touch of citric sweetness. The palate went it a fairly creamy direction, and displayed more grassiness, subtle hop bitterness, stone fruit, and citrus. Tasty, though not quite as "juicy" as expected. The wasabi-glazed chicken was a pleasant surprise. I got a very palpable sweetness at first, but this led to a mild burn from the 'sabi and a finish loaded with lingering sesame. Give it a try. 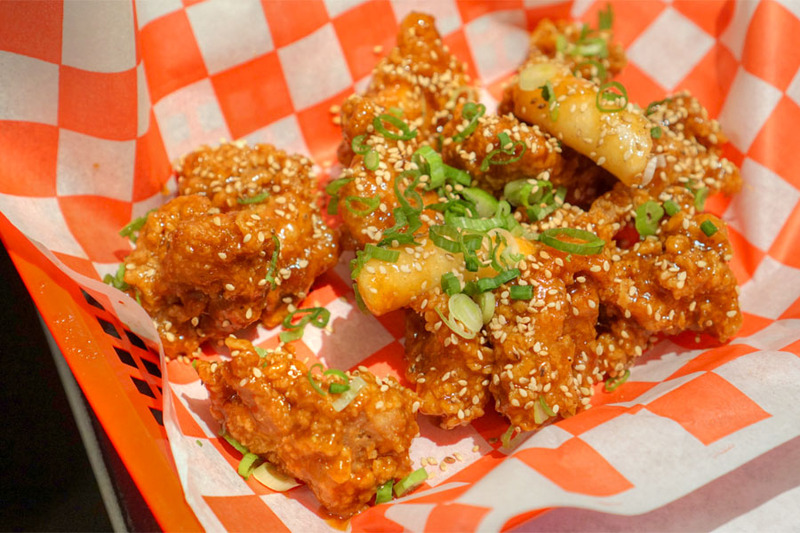 The crunchy chikin mu (pickled Korean radish) was just what you'd expect. 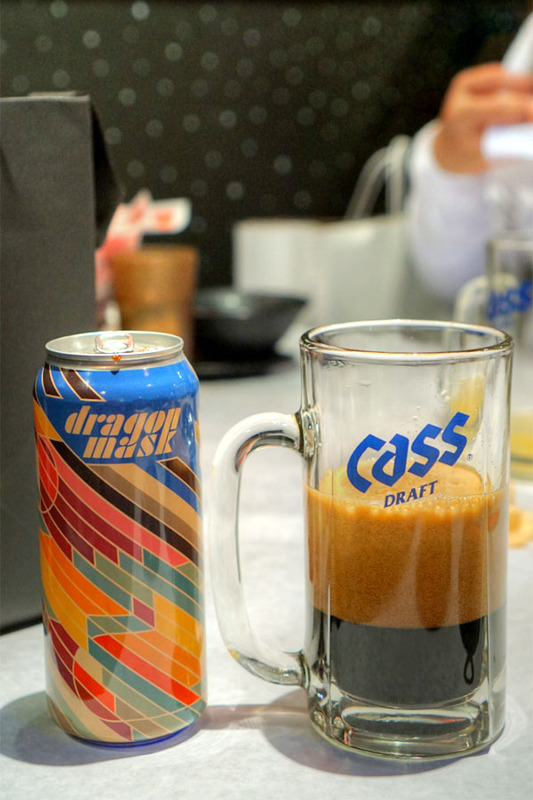 Our final beer was the 2017 Modern Times Dragon Mask, a churro-inspired imperial stout brewed with cinnamon, cacao nibs, salt, and vanilla that was created in collaboration with Casita Cerveceria. Nose of cocoa, roast, subdued vanilla, and light soy sauce. In terms of taste, I got primarily chocolate and caramel flavors, along with coffee and dark fruit, with a bit of an underlying heat. Nice, but I didn't really get the churro that they were going for. This last basket of chicken was much heavier than I'd anticipated. The bird was definitely sweet, but also had a sort of malty, almost caramel-y flavor profile that I wasn't expecting (from the honey, I assume). I also didn't get much from the garlic, which I think would've made this a bit more balanced. The chicken could perhaps use a couple of tweaks, but overall we had a pretty decent chimaek experience here. It's sort of a fun spot, and I wouldn't mind exploring more of the flavors. Looking at restaurant and food space, I decided to come here to try it once. And it really did not disappoint me!